An experiment involving “pre-clearance” of U.S.-bound trucks on the Canadian side of the Peace Bridge has been declared a success by federal officials. The decision paves the way for new and permanent inspection booths in Fort Erie, Ont., aiming to reduce congestion on the international span. The six-month pilot program passed the test of U.S. Customs and Border Protection with “flying colors,” Sen. Charles E. Schumer said Wednesday. He is a longtime proponent of the pre-clearance program. Once details are approved by both Washington and Ottawa, construction of as many as 12 new pre-inspection booths in Fort Erie will reduce wait times for commercial vehicles by as much as 75 percent, and eliminate commercial wait times of more than 30 minutes. And in Washington’s summation of the experiment’s results, Customs and Border Protection officials also declared the project a success – even if it will prove expensive to implement at about $44 million. 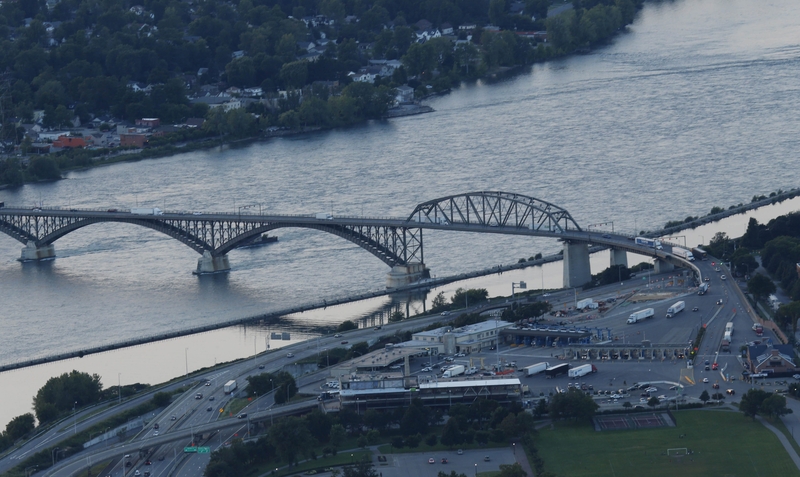 “Fully implementing the cargo pre-inspection program would significantly improve the port congestion and commercial wait times currently experienced at the Peace Bridge,” the Customs report said. It also noted that congestion will be lessened by as much as 75 percent only during July and August when truck traffic decreases, but which could prove significant as more passenger vehicles often cause congestion during summer months. The much-anticipated report was hailed by Rep. Brian Higgins, D-Buffalo, who also has long pushed for pre-inspection approval. He called the report “very good news,” and added that some measures – such as ending cash transactions at the bridge and requiring electronic manifests for all trucks – could be implemented immediately. He said the new report indicates those actions alone would reduce truck-processing time from 22 to four minutes and that 96 percent of trucks could clear Customs in under 15 minutes. Bridge officials said Fort Erie pre-inspection was suspended when the pilot project wrapped up in late January, and are unsure when it will resume. But it is expected that a new agreement between the two nations will allow the program to continue permanently. Still, the new development caps an effort of several years by Schumer, Higgins, and the Peace Bridge Authority to reduce congestion by redirecting trucks into a former parking lot on the Ontario side of the bridge for inspection by U.S. agents. A similar pilot project in Blaine, Wash., also met with favorable results. The newest development follows a March agreement between the U.S. and Canada that allows U.S. Customs agents to perform their duties in Canada – and vice versa – under a landmark border preclearance agreement stemming from the 2011 “Beyond the Border Initiative” signed by President Obama and Prime Minister Stephen Harper. The agreement appeared to resolve Canada’s longtime reluctance to allow armed U.S. agents to work on the Canadian side of the border. Washington officials who asked not to be identified said Customs and Border Protection Commissioner R. Gil Kerlikowske briefed Schumer on the results of the study early Wednesday while granting his approval. The move allayed lingering fears that Customs concerns eventually would derail the project. Along with other new measures such as eliminating cash transactions and installing more efficient radiation detectors, officials now anticipate a much smoother crossing for commercial vehicles. And with fewer trucks clogging the bridge, they add, passenger vehicles also should anticipate faster crossings once the program is fully implemented. Under the pilot project, two inspection booths on the Canadian side were dedicated to inspecting U.S.-bound traffic, Peace Bride Authority General Manager Ron Rienas explained when the program began last year. Those two lanes had radiation-detection equipment and all the other features of the truck inspection lanes on the American side. Trucks inspected in those lanes were then either cleared through a dedicated lane on the American side with a green light or stopped for a secondary inspection in Buffalo. The pre-inspection pilot project was slated to cost just under $1 million, in contrast to the $44 million projected to build at least a dozen inspection lanes to accommodate all U.S.-bound cargo on the Canadian side. It is not yet known when construction on the new project will begin.